This week I had the pleasure of visiting Barnsley College’s Think Low Carbon Centre, built within the grounds of my old secondary school at Honeywell; The Centre is the result of a £2.75m investment from the European Regional Development Fund through the Yorkshire and Humber ERDF Programme 2007-2013, with the remainder of the project funded by the College. Roy Thomas, Programme Manager at the Centre and the GQA Approved Centre Coordinator, along with senior lecturer, Eric Passmore, gave me a tour of the facility and detailed some of the green technologies behind the Barnsley College initiative. The Centre is a comprehensive resource for anyone wanting to see how low carbon buildings look and work; the impressive visitors entrance and reception immediately caught my eye as the reception desk is fronted by a significant piece of art encapsulating cullet and light. Amongst the green technologies I saw were solar panels, triple glazing, a wood-pellet powered bio-mass boiler and under-floor heating that is fuelled by an air-source heat pump that captures heat from outside the building. All power generated is displayed within the centre for visitors to see. The centre also recycles rainwater used for toilet facilities and has reflective sun-pipes allowing natural light in dark rooms. 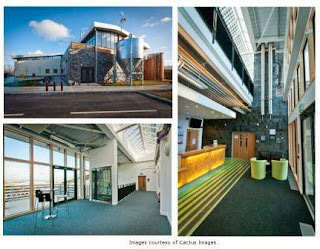 Walking around the facility gave a feeling that this is somewhere that working and learning would be enjoyable; the main workshop had a plethora of features that made it more than just a place of learning; from the ‘sight panels’ showing three types of insulation (Sheep’s Wool, Straw and recycled Denim), to the acoustic ceiling panels that reduce echo and reverberation, allowing sound to travel to the four corners of the room effectively and clearly. A second workshop houses fully ergonomic work stations and testing rigs for a variety of technologies, with a separate area housing bay sections for practical delivery of external wall insulation sessions. All around the facility, visitors and students alike are able to see how the Centre utilises green energies with many of the technologies visible and not covered – from the insulation sight panels in the conference room to the very visible under-floor heating system on the first floor. The College currently delivers learning programmes linked to green technologies and is bracing itself for the start of the new term, welcoming in students onto a variety of courses. While the College is a GQA Approved Centre, much of the work on our qualifications is carried out on site, but with the potential of the Think Low Carbon Centre evident, it is hoped that we will see GQA involvement in this fantastic facility in the very near future.